Traditionally, the placement of digital signage screens has been high-up, in our direct line of vision. Unlike static forms of media, like billboards and posters, these digital signage displays engage customers and passersby with their movement and colourful content. But over the last few months, we’ve started to notice an interesting new trend… table-top digital signage! As the name implies, table-top digital signage displays are located within actual table-tops. The reason is simple: these screens aren’t just meant to be watched, they’re meant to be used. Table-top displays present a huge potential for advertisers and marketers: normal digital signage screens are viewed for only a few seconds before the viewer moves on, while table-top displays are likely to be used for much longer periods of time. After all, the user is seated, rather than moving past. This also enables businesses to make their content a lot more interactive, engaging with customers in more advanced ways. 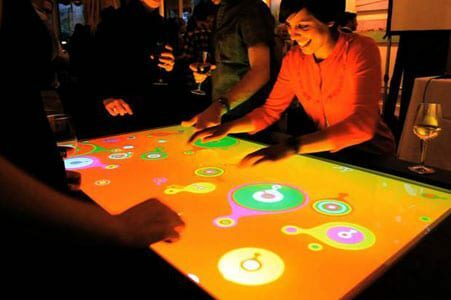 Interactive digital signage is the future of the DOOH media industry, and table-top displays are the next logical step. So how are these displays currently being used? Not so surprisingly, the restaurant and bar industry has been one of the first to adopt this new technology. It allows them to promote their products in a fun, engaging way – enabling patrons to find out information about menu items and order them using the touch-screen display. It’s even rumoured that table-top digital signage could eventually find its way to schools, where teachers could use it to find new and fun ways for students to take part in classes. Above all, the new table-top displays showcase once again just how versatile digital signage technology can be. The sky’s the limit!